This darling new cotton blend bonnet features pink satin ribbon insertion and a heart shaped closed crown trimmed with lace. Sizes newborn, newborn to 3 months, and 3 to 6 months have a wide lace trimmed face ruffle framing the face (pictured below). 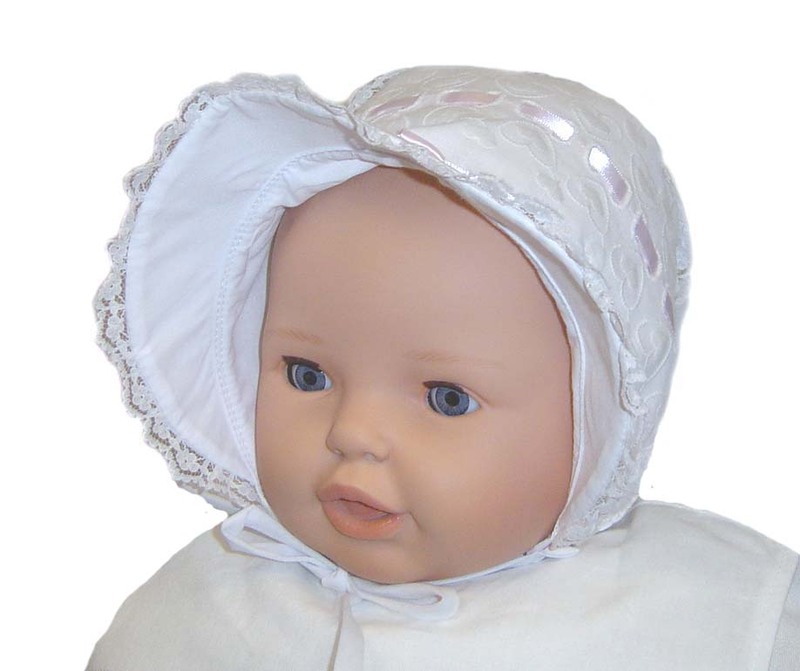 Sizes 6 to 9 months and larger have face brim rather than ruffle. See pictures left. Embroidered hearts and white satin ribbon insertion accent the sides and top. The bonnet ties under the chin with fabric ties. This would be a lovely christening bonnet or the perfect bonnet for your baby's portrait or any special occasion. Note: This darling bonnet is also available with white ribbon insertion. See below.